Once you have registered with CoinMate.io, you can immediately begin to deposit bitcoin onto your account, and trade this on the exchange. Depositing bitcoin is straightforward, and funds will be available on your account after two confirmations. The exchange does not charge for bitcoin deposits or withdrawals. The minimum deposit and withdrawal for bitcoin is 0.001btc. To deposit bitcoin, go to the Finance page and click on deposit. You will be given a unique bitcoin address. You can generate a new address every 24 hours. Go into your bitcoin wallet, and enter the amount of bitcoins you would like to deposit, and enter in the bitcoin address. Once this is submitted to the network, it will automatically be credited to your account once the transaction has been confirmed twice. You can then begin to trade your bitcoin on your account. To withdraw bitcoin, go to the Finance page and click withdraw. Here you can enter a bitcoin address for your wallet, and the amount of bitcoin you would like to withdraw. You will then either be sent a code by email to confirm your withdrawal, or enter in your Google Authenticator code. Once this is done, within a minute, the withdrawal will be processed, and you will have the bitcoins transferred to your wallet. This blog post looks at the registration and verification process on the CoinMate.io bitcoin exchange. Registering is required to deposit, withdraw and trade bitcoin or withdraw and deposit using OKPay, while verification is required if you would like to deposit or withdraw in Euro, Czech Koruna or Polish Zloty. Please note as a policy, we do not open accounts for US Citizens. 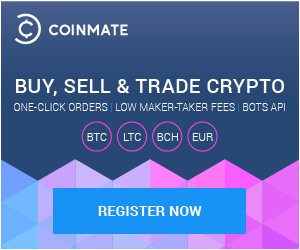 Registering with the CoinMate.io exchange is straightforward. Simply select your country, your email address and your password. You also need to accept our terms and conditions. Once you have registered, you will need to check your email and click the activation email to gain access to your account. Once this is done, you can lodge and deposit bitcoin, and trade on the exchange. If you would like to utilise the exchange to convert bitcoin into any of the currencies we support, we require verification of your identity to comply with anti-money laundering regulations in Europe. This process usually takes no more than one working day, and this can be sped up by contacting our support using the exchange’s chat function. Individuals are required to securely upload high resolution copies of identity documents. We accept nationally issued photo ID, Passports or drivers licenses. We also require either a utility bill, or a second ID, as well as a copy of a bank statement. For businesses looking to register, we require a Certificate of Incorporation, and we will do further verification of business accounts to ensure that the named individual is a director of the company. Once the verification process is complete, you will be able to trade on the exchange. So why not sign up to CoinMate.io today!